Based on reviews from 5,208 users. Learn how our rankings work or see our guide to Nike Shox sneakers. Updated Apr 2019. 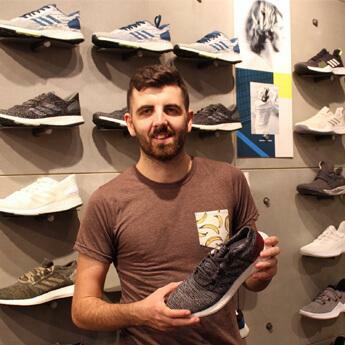 For years, Nike has always been one of the top players in the sneaker industry along with other famous brands such as Adidas, Under Armour, Puma, Merrell, Reebok, Vans, New Balance, Asics, Keds, and many others. Continuously leaving a strong presence in the market, the American footwear brand giant shows no signs of stopping in producing top-of-the-line Swoosh sneaker models for all kinds of consumers worldwide. Nike started as an athletic footwear brand, but eventually expanded its product line to include lifestyle-focused shoes, apparel, and accessories to cater to a broader market. Its success is no surprise, and one reason behind that triumph is the brand’s focus on the research and development of new technologies and innovations that do not only apply to Nike sneakers, but also to other products like apparel and athletic shoes like running shoes, basketball shoes, and training shoes. One of these technologies is the Nike Shox. It is a revolutionary cushioning technology that took 16 years of research and development process and launched in 2000 - even before Nike Lunarlon or Adidas Boost. Visible on Nike Shox sneakers’ midsoles, the technology uses highly resilient Nike Shox columns made of an energy-efficient material in between lower and upper heel plates to the heel area for enhanced durability and “boing” or springlike effect, which gives superb cushioning and impact protection to the feet. Nike Shox’s technology took inspiration from Harvard’s “tuned” indoor running track equipped with a bouncy surface that absorbs impact energy from runners and returns it back into their every step - sort of like a spring effect. After several attempts using varying materials, the developers successfully came up with a TPU heel counter that can support four hollow polyurethane columns for equal energy distribution from an impact. Nike Shox sneakers, simply put, are sneakers developed by Nike that incorporate the Shox technology in their midsoles. Although featuring a variety of styles and designs, these sneakers have a unifying characteristic – visible Shox columns on the heel. Typically, there are four Shox columns in a square formation, but these vary depending on the shoe model. Some Nike Shox shoes feature five or six Shox columns, while those in the Shox TL series have Shox columns all throughout the midsole. Below are recent Nike Shox shoes and their notable colorways and iterations. The sophisticated Nike Shox Gravity marked the official return of Nike Shox sneakers on the market. A trio of Nike designers worked in this shoe including Aaron Cooper (who worked on the Shox BB4 model), Greg Thompson, and Brian Farris. It was conceptualized in March and brought into life only a month after, precisely on April 19, but made its market debut on January 12, 2018, via select Nike retailers and Nike SNKRS for $140. Countless of the colorways have released since then. The Nike Shox Gravity gives an ultimate lockdown fit through Flywire cables that function along with the laces and cinch system. The Shox system features twin plates that collide with foam cushioning for responsive feel while maintaining the Shox’s signature aesthetic. The upper material is typically made of mesh for breathable comfort. It is a low-top sneaker with sizes available for both men and women. Women's sizing ranges from 5 to 12 in B Medium width, while men's sizing is available from 6 to 15 in D Medium width. Released on January 12, 2018, for $140. It features a multicolor look with a metallic gold heel counter. White mesh material dominates the upper of these Nike Shox shoes with hints of red on the Flywire cables. In spite of not being an all-white sneaker, this Shox Gravity colorway could still be an excellent pair to strut as a take on the white sneakers trend. First made available in January 2018 at a retail price of $150, this shoe features a navy blue mesh upper with metallic gold accents on the sides, tongue, and heel. A small gold Swoosh on the white heel counter finishes off the look, while another white contrast is seen on the midsole. The signature Shox system, on the other hand, is dressed in yellow for a perfect contrast. This particular shoe is an excellent option to consider if you are looking for blue sneakers. The “Black” or black/purple colorway of these Nike Shox sneakers released in January 2018 along with the highly anticipated “Metallic Gold” colorway. It is the third official colorway of these modern Nike Shox sneakers. The upper is dressed in a deep purple knit material while black caging side panels complement the look. The heel counter is black as well. The Shox unit, on the other hand, flaunts a light purple color with blue outline near the heel. Unlike the earlier mentioned colorways, the “Triple White” edition of these Nike Shox sneakers dropped a few months after. It features an all-white aesthetic starting off with a white knit upper then white Flywire cables, fastening system, and signature Shox technology. Because of its clean look, this colorway offers versatility in styling. The White/Black colorway of these Nike Shox shoes flaunts a beautifully crafted two-tone upper. The toe area shows a white mesh material, while towards the tongue and heel is a total contrast of black. Hints of suede are seen onto the heel panel with a jewel Swoosh on the lateral sides. The outsole is translucent with a Shox unit in black. After the release of the Triple White and White/Black colorway of the Shox Gravity shoe, these Nike Shox shoes also received a classic “bred” treatment – a “Black/Red” colorway popularized by the Air Jordan 1 kicks. For this shoe, black mesh dominates the upper while hints of red are visible on the entire Shox system. The midsole bears speckled details while Swoosh on the side panels completes the look. These Nike Shox sneakers are a luxury take on the Shox Gravity model. The upper features a breathable mesh material in black and honeycomb-textured heel overlay, while hints of green are seen on the Shox system and Swoosh branding on the sole. The lacing system also receives an upgrade and features an elastic pull tie instead. It released on February 1, 2018, for $150. The Nike Shox NZ is one of the first Shox running-inspired sneakers created and a popular Nike Shox shoes model. Initially released in 2002, it is still being produced today in various colorways and modernized versions. It has also been made available for customization on NIKEiD. The Nike Shox NZ has a one-piece upper that is typically made of synthetic and textile materials. This shoe’s Shox system features four (4) columns in the heel, which functions for shock absorption, impact protection, and cushioning. On top of these columns is a Pebax® plate for lateral stability and support. It has a low-top construction with a Gilly lacing system for a lockdown and secure fit. On the forefoot is Phylon padding for lightweight cushioning. The outsole of these shoes is of BRS 1000 carbon rubber material with a modified circular Waffle pattern for durable grip or traction. 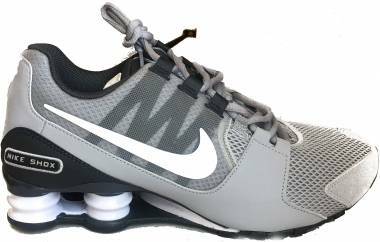 These Nike Shox shoes run true to size and are available for both men in women in Medium or Standard width. Men’s sizes range from 6 to 14, while women’s sizes are from 5 to 12. These women-exclusive Nike Shox shoes in Bronze/Hyper Punch-Volt-White colorway released as part of the “Trophy Pack” in July 2014. It features a white leather base with foil green and gold overlays accented with an iridescent and color-shifting material. Inner linings, eyelets, and Swoosh brandings are dressed in contrasting orange and lime green color accents, while the outsole flaunts a translucent green color. 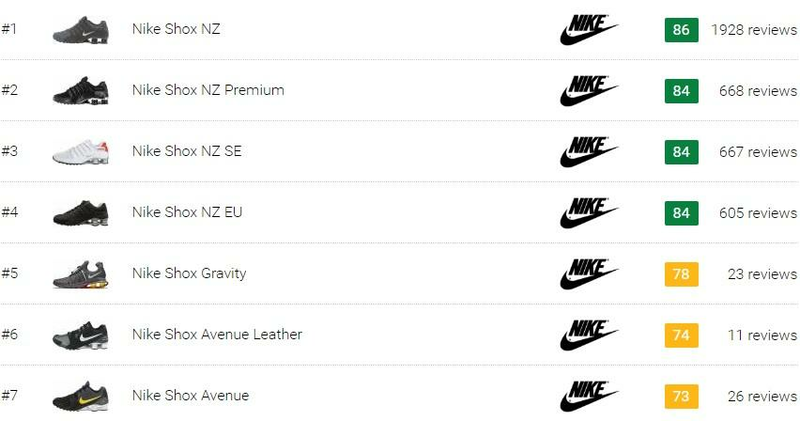 Released in June 2015 is the Premium “Croc Pack” of the Nike Shox NZ shoes. Made available in two colorways, Nike followers had options between “Predatory Black” or “Albino White” for these embossed faux croc-covered Nike Shox sneakers. Metallic detailing is visible at the heel, while the signature four-column Shox system is in silver (for the black-based colorway) or gold (for the white-based colorway). These Nike Shox sneakers are also referred to as Nike Shox PRM Croc Pack. The Nike Shox NZ Premium is similar to the Nike Shox NZ silhouette but differs in a way that it utilizes premium materials. Following a running-inspired shoe profile, it flaunts a combination of mesh and leather on the upper, a Gilly lacing system for a lockdown fit, and, of course, Nike Shox columns. Also featured are blown rubber outsole lugs for responsive cushioning. Sizes available for these Nike Shox shoes range from US 6 to 14 for men and US 4 to 11 for the ladies, both in Medium or Standard width. Like any other Nike Shox sneakers, the Nike Shox NZ SE shoe offers optimum impact protection and cushioning for a comfortable ride. Shadowing the Shox NZ silhouette, this SE iteration also features synthetic leather and mesh upper with a Gilly lacing system and four columns of Nike Shox system in the heel. The Nike Shox NZ EU debuted in April 2014 in White/Metallic Silver-Black colorway. These Nike Shox sneakers feature a black and white aesthetics with gradient blending towards the eyelets, while the four-column Shox system is dressed in silver that matches the small swoosh along the side panels. This shoe is an exclusive drop in Europe, hence the EU in the official shoe name. The Nike Shox Avenue shoes have a low-top construction with sufficiently padded tongue and collar. The one-piece upper is made of mesh material for breathability with synthetic overlays for support and stability. For a lockdown and secure fit, it features a Gilly (otherwise known as Ghillie) lacing system. The Shox system of these Nike Shox sneakers remains faithful to the Shox’s original aesthetic, which features four-column cushioning in the heel. The Nike Shox Avenue Leather displays classic Nike Shox sneakers look that Nike followers and seasoned sneakerheads love throughout the years. Unlike regular Nike Shox Avenue sneakers that feature mesh as the primary upper material, the upper of this iteration is dressed in quality leather and mesh for enhanced durability that does not sacrifice style. 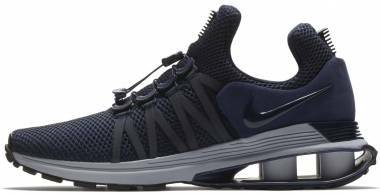 These running-inspired Nike Shox shoes come in men’s sizing from 6.5 to 15 in D Standard width. Other retailers also refer to this shoe as Nike Shox Avenue LTR. This Premium iteration mimics the core Shox Avenue model in materials and construction. Like the Shox Avenue and the Shox Avenue Leather, the Nike Shox Avenue Premium utilizes a combination of mesh and leather as an upper material. However, this recent version uses pure synthetic leather of premium quality. Other retailers also refer to this shoe as Nike Shox Avenue PRM. Whether you are looking for a pair of black, grey, or silver sneakers, these women-exclusive Nike Shox sneakers can offer what you need. Available in a wide array of colorway selections, the Nike Shox Avenue is created to give wearers a lighter and nimbler ride without the need of sacrificing signature Shox’s aesthetics. Like any other Shox Avenue iteration, this version retains the four-column Shox system for excellent cushioning and impact protection. Made available as early as 2013 is the Nike Shox Deliver. Another kind of not-so-popular Nike Shox shoes, this Swoosh is still up for grabs up to this day at select retailers for as low as a discounted price of $80. Based on a running-inspired silhouette, this low-top features a leather upper with distinguished perforation detailing on the sides for flexibility, durability, and breathability. The Nike Shox Deliver utilizes the brand’s Shox midsole technology by incorporating a four-column Nike Shox system in the heel that works hand-in-hand with a Phylon midsole for exceptional cushioning and impact protection. Unlike most Nike Shox sneakers, this model bears a traditional lace-up closure instead of a Gilly lacing system for an adjustable and comfortable fit. Also featured is a rubber outsole for traction. Completing the sporty flair of these Nike Shox sneakers is a prominent Swoosh on each side that extends toward the heel. This low-top sneaker is offered in men’s sizing, but preschool and toddler sizes are available as well. Released in 2012 just in time of the National Football League (NFL) season that year is the Miami Dolphins-inspired colorway of the Nike Shox Deliver silhouette. The classic Shox sneakers received a full leather construction with Shox system in the heel for cushioning and shock absorption. White color dominates the upper, while hints of Miami Dolphins’ signature orange color are seen on the side and tongue Swoosh, outsole, and Shox columns. Contrasting teal that matches the team’s official color, on the other hand, is seen on the inner linings, laces, and part of the heel area. Each pair retailed at $120. These Nike Shox sneakers make a great addition to anyone’s collection of black shoes since they present an all-black color from the upper down to the sole unit, including the entirety of the Shox system in the heel. Joining Nike’s long list of mid-top sneakers is the Nike Shox TLX Mid SP shoe model. First released in June 2014 through NikeLab after an extended hiatus of the Shox line, this Shox shoe called the attention of sneakerheads and loyal Nike followers because of its innovative technology coupled with impressive aesthetics. It features a combination of mesh and laser-cut perforated leather on the upper with reflective 3M details. It also utilizes Dynamic Flywire support for a lockdown fit and a full-length Shox platform for superb cushioning. Previously released colorways include "Black," "Bordeaux," "Grey/Metallic," "Black/Volt," “Black/Metallic Gold,” and “White/Purple” among others. This colorway of these Nike Shox sneakers dropped on October 9, 2014. Definitely another stylish pair of Nike black sneakers, it displays an all-black exterior from the entirety of the premium perforated leather upper down to the full-length Shox sole unit. The Red/White colorway of these Nike Shox sneakers dropped along with the tonal black colorway on October 9, 2014. The upper features similar premium perforated leather material, but is dressed in tonal red. The Shox midsole displays a contrasting white color, while the outsole is of gum rubber material for optimum traction. Following the release of the “Black” and “Red/White” colorways of these mid-top Nike Shox shoes is the release of the "Iridescent" colorway, which dropped on October 23, 2014. As beaming with futuristic vibes, this shoe boasts a grey perforated upper with reflective detailing along the tongue and heel. The Nike Shox TLX Mid SP in Black/Volt colorway features a dominantly black perforated leather upper with neon green accents on the Flywire cables, insoles, tongue, inner linings, and a heel pull tab. The entire Shox unit in the midsole displays a speckled design accent for added oomph, while the leather tongue and rubber outsole are also dressed in black. This dope colorway released on June 27, 2014. The Nike Shox Vaeda is one of the many women-exclusive Nike running shoes on the market. It is characterized by a five-puck Nike Shox midsole platform that delivers enhanced cushioning and reduced impact-related injuries. The upper is made of synthetic material with sufficient overlays for support, flexibility, and superb fit and feel. In addition, the outsole is composed of carbon rubber in the heel area and rubber in the forefoot, while the closure system follows a Gilly type for a secure and adjustable fit. Swoosh brandings are visible on the tongue and side panels. This colorway of the Nike Shox Vaeda shoes displays a mainly white upper with hints of metallic silver on the side panel, Swoosh brandings, tongue, toe box, and heel. The rubber outsole, on the other hand, is in black for a perfect contrast. 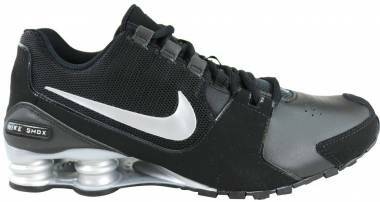 These Nike Shox shoes are also made available in black for those who like some versatility with their kicks that does not come with a worry of getting them dirty quickly. Almost similar to other shoes “Triple Black” colorways, this shoe boasts an all-black aesthetics from the upper to the sole unit, except only that some small design details and Swoosh brandings on the tongue, heel, and toe box are in silver. For these grey sneakers, the synthetic upper has supportive black and grey overlays a contrasting neon pink accent on the Swoosh and Nike Shox side panel branding. The laces are black with matching pink piping, while the inner linings and Shox columns are also of bright pink appearance that deserves attention. The outsole is black, but hints of vivid pink can also be seen. The Nike Shox Current shoes are running-inspired Nike Shox shoes made available in men’s and women's sizes. It features a sleek look with a stylish upper and finger design midfoot overlays for optimum support and a locked-in fit. Between the midsole and the Shox columns is an added plate for improved lateral stability. Perforations are placed throughout the heel and tongue. 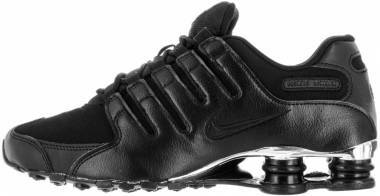 This women’s Nike Shox sneakers feature a metallic silver upper with tonal midfoot overlays. Inner linings and laces are grey, while a fresh contrast of vibrant orange is seen on the Shox unit at the heel. Perforation details donned the heel area. Probably another addition to a lineup of bred sneakers, this colorway of the Shox Current flaunts a dominantly black upper with hints of red underlays and red side Swoosh. The Shox system stands out in a metallic silver color. Another white sneaker from Nike comes in the form of Nike Shox Current. This colorway features a white synthetic leather upper, including the tongue, and tonal Gilly type of laces. Swoosh brandings on the tongue, toe box, and side panel are all in black, while the heel area overlays and Shox system are both in metallic silver. This Nike Shox Current colorway is available in kids’ sizes. Like other Shox Current shoes, the upper is made of synthetic leather material but is dressed in light grey color matching the laces while overlays on the toecap, midfoot, and heel areas are of a darker grey color. Pink accents are seen on the Nike brandings on the side and tongue, and a bit on the lower plate of the Shox unit. 1. What were the first Nike Shox sneakers? When the Shox technology was introduced to the sneaker world in 2000, the Shox line included three shoe models – the Nike Shox R4 (a running shoe), the Nike Shox BB4 (a basketball shoe), and the Nike Shox XT (a cross-training shoe). Sergio Lozano and Bruce Kilgore designed the Nike Shox R4 running shoe. The “R” in R4 stands for “running,” while the “4” stands for the four-column Shox system. It released in various colorways with a futuristic design inspired by track shoes. The original colorway is the White/ Silver – Red colorway. It was featured in NIKEiD for customization. In 2003, an exclusive European edition of the Shox R4 was launched. The Shox BB4 is a signature shoe of NBA star Vince Carter. The original colorway is the “Black/ Metallic Silver – Lapis” colorway. Eric Avar designed it with a "rocket and booster" appearance. The upper took inspirations from space suits while making the Shox unit as the shoe’s focal point. The Nike Shox XT debuted in 2001. It features a Posite-based upper and a zipper shroud. 2. What is the design inspiration for the Nike Shox aesthetic? Nike Shox sneakers’ aesthetics feature visible Shox columns that are inspired by Formula 1 race cars. These columns are produced using the same materials that are being utilized in Formula 1 cars’ jounce bumpers. Similar to Shox columns, a jounce bumper functions to bring unparalleled shock absorption. 3. How was the idea of using Shox columns in Nike midsoles formed? It was in 1984 when the idea of mechanical cushioning was born. Nike designers and engineers started experimenting with biomechanical ways of optimizing energy return on shoes. First, they utilized springs made of steel to a midsole of a running shoe to observe improved performance. Use of multiple layers of leaf-spring heel unit for stability and cushioning followed a year after and several more trials using varying hinges and mechanical columns were also made throughout the ‘80s. All these led them nowhere. By 1997, the idea of using twin plates with foam columns came up, and the rest was history. It was the same concept that resulted in the original Nike Shox launched officially in 2000. 4. How did Nike Shox technology become highly popular when it launched? Nike Shox is one of Nike's most significant technologies ever created by the Swoosh brand after the Air Max. In 2000, it was an entirely new technology, and its proper introduction to the sneaker market was crucial. To ensure that this technological advancement in Nike footwear products would hit the right set of market and be recognized as effective, a six-month marketing campaign was created. Prior to launch, Nike made sure that Nike Shox and the brand itself would create a buzz while building a sense of credibility, authenticity, and visibility across several media platforms and known personalities in sports and the automotive industry. 5. Who was the official endorser of Nike Shox? Vince Carter, an American professional basketball player, debuted one of the first Nike Shox shoes, the Nike Shox BB4, during the 2000 Sydney Olympics. That time, Carter was the reigning slam dunk contest champion, and he made the iconic dunk over a 7’2” Team France center, Fredric Weis, wearing a pair of Nike Shox BB4 shoes. Many believe that that is the greatest dunk of all time, and later on called as the “le dunk de la mort” or the Dunk of Death. It was such an iconic moment that Nike took advantage of and made it a part of its marketing strategy for the shoes. There was also a Nike Shox commercial featuring the basketball superstar. 6. What are the most popular and best seller Nike Shox shoes? Nike Shox sneakers, in general, are again a must-have for sneakerheads and sneaker buyers following the release of the Nike Shox Gravity shoes. 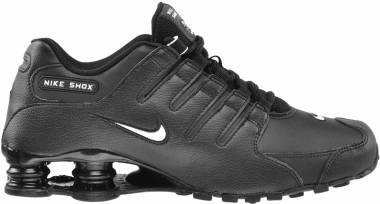 The Nike Shox NZ and Nike Shox Turbo are just some of the best-selling Shox models. 7. Are these Nike sneakers customizable? Yes. Some of the recent Nike Shox sneakers are available for customization through the NIKEiD site where buyers have options to choose colors and style for their shoes. Processing and delivery take about 3 to 5 weeks. 8. Are Nike Shox sneakers a kind of shoe that celebrities and other famous personalities also love? Yes. Jerry Seinfeld is known to own a massive collection of Nike Shox sneakers that include an assortment of Nike Shox Turbo shoes. Aside from wearing Shox shoes in his TV shows Seinfeld and Comedians in Cars Getting Coffee, the actor has been photographed several times wearing different kinds of Nike Shox sneakers including the Nike Shox NZ “White/ Royal,” Nike Shox NZ “Gold,” Another known celebrity that frequently wears Nike Shox sneakers is Dr. House in the TV series, AKA Hugh Laurie in real life. Many Shox kicks have made appearances in several episodes of the TV series, including the Nike Shox Turbo, Nike Shox Ride Plus, Nike Shox Swift, Nike Shox Junga II, and Nike Shox 2:45. 9. What are the Shox shoe models designed for basketball? 10. Is the Shox technology patented? Yes. Nike Inc. claims that 19 or more separate patents protect the Shox technology on its innovative cushioning system. In February 2006, Nike filed a legal complaint against its rival Adidas-Salomon in a Texas court for infringement of its Shox technology. Nike stated that the Three Stripes infringe upon Shox by using the Adidas a3 cushioning system on shoes including a Kevin Garnett signature shoe and the Adidas_1 shoe model. In October 2008, the Swoosh brand filed a patent suit concerning its Shox technology in a court in Illinois against Wal-Mart Stores, Inc. for infringement of two patents. Nike claimed that Wal-Mart sells shoes that exhibit cushioning similar to that of Nike Shox sneakers.